Valentine’s Day is always the perfect opportunity to grand romantic gestures. This year, I’ve been asked by many friends what could be a romantic surprise on Valentine’s Day in Berlin. So I made a list of 5 places with candlelight dinner or romantic atmosphere, to help you and ensure an unforgettable Valentine's Day this year in Berlin. PS: Berlin is the Germany's singles capital, so no needs to feel left out on Valentine's Day. If you aren't in the mood for roses and hearts, you could spend this day with your friends at all those places too ;). Probably the most romantic spot in Moabit for fine dining dinner accompanied by very cozy crackling fireplace to create that romantic ambiance for Valentines Day! 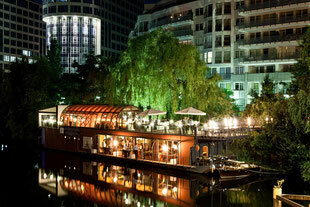 The ship restaurant is located on the river Spree with a fantastic view and neatly served food but still kept young with all the service staff. It will impress you with a menu you won’t forget. BON APPETIT. At Frau Tonis Parfum perfumes speak for themselves. The perfume boutique offers the ideal (romantic) setting to discover their exquisite line of fragrances in a serene setting. Engage in dialogue with our fragrances; from the fresh, floral „Linde Berlin“ to the energetically tangy “Berlin Summer”. Create your own customized fragrance with you partner! Frau Tonis´ scent experts will help along the way to creating your tailor-made fragrance and will make your Valentine’s Day special. In case you have done this workshop already, you can visit www.themakery.de, to find the best and most interesting workshop for Saint Valentine's Day. EAT. DRINK. LOVE, Valentine’s Day is coming up and as we all know caring is sharing. Blend Berlin designed recipes for the perfect Valentine’s Day. They created three sharing dishes for two for a little extra romance and of course this unique dinning experience will include a chocolate fondue for dessert. 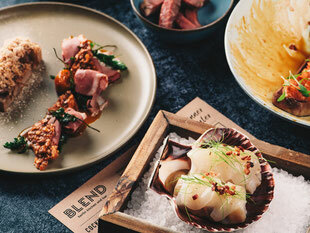 If you feel like it, you could visit this dessert bar – my personal dream come true – after your dinner at Blend Berlin and njoy one to four courses of desserts with /without cocktails at the bar (from 22:00). 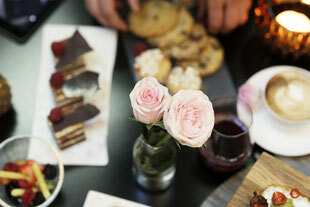 Celebrate Saint Valentine's Day with a brunch as unique as your lover is. Just to give you an idea, here are some highlights of the brunch: Spanish delights incl. oysters and freshly squeezed juices at the juice bar as well as ice cream and CANDYFLOSS. While you can enjoy the romantic atmosphere of the restaurant, you will also be listening to live music. Those who fancy a nice walk afterwards should plan a visit to Zoo Berlin, as you can enter the zoo through the private access on their terrace. The hotel also hosts a spa, in case you need it ;). 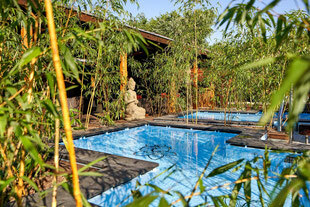 Probably one of the most beautiful spas in Berlin and perfect for Valentine's Day. Vabali Spa offers a romantic and cozy atmosphere. Find peace and quietness in Germany's busy capital! Have a drink at the chimney, a swim in the outdoor pool or try a phenomenal infusion with a coconut peeling in one of the saunas. Just relax.